While it's quite common to use an Android tablet as an ebook reader, few are designed to fill that need from the ground up. Amazon, B&N, and Kobo have each tried their hand at it, and over the past few weeks I have been looking for a way to add similar features to the cheap Android tablets I like to use. In short, I have been looking for an ebook or media library app which can replace the home screen launcher app on Android tablets. Reading apps are a dime a dozen, but apps which manage your media library and put it front and center are comparatively rare. I still haven't quite found what I was looking for, but I did come across a few useful tricks that I wanted to share. If you're not sure what I am getting at, let me explain by example. Ever since I reviewed the Kobo Arc 7 a couple weeks ago, I have been looking for a way to add a few of its better features to other Android tablets. The home screen on that tablet devotes most of its space to a user's Kobo ebook library, with 2 of the 3 pages of the home screen devoted to either a user's current reading activities or their ebook library. I don't buy most of my ebooks from Kobo so their tablet doesn't work for me, but I still like how that tablet focuses on ebooks first. This has inspired me to go look for alternate home screens which might offer a similar focus. I haven't found what I am looking for yet, but along the way I did come across 5 launchers which would make your Android tablet look like everything from an iPad to a Windows Phone, and I also found a few other possibilities that might suit someone else. For example, a number of reading apps (Google Play Books, Aldiko, EZPDF reader, and others) offer a widget which you can add to the home screen on your Android tablet. These widgets don't offer the tight focus I want, but they do let you browse your ebook library from outside the related reading apps. And if you combine them with widgets for other types of reading apps (like Flipboard or Google newsstand) you can enhance your overall reading experience. Here is a screenshot showing a few of the ebook widgets I found. Aside from Aldiko, I don't have enough titles in any single app to really show them in operation. 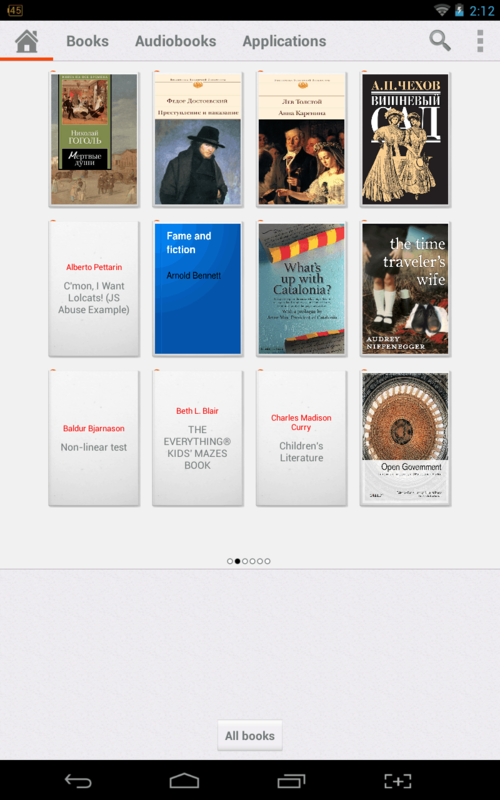 But I do know that the Aldiko widget lets you swipe through the ebooks you have recently read. It doesn't work very well (it's laggy) but it might perform better on your Android device. Even though I haven't found a launcher which works for me, I have found one possibility that comes pretty close. A Russian ebook company by the name of LitRes has released an Android launcher that focuses on your ebook and audiobook library. It doesn't do what I want but it does come close enough that I will sigh deeply as I set it aside. LitRes is the leading ebook retailer in Russia, but they do more than just sell ebooks. They have their own ereader, and they've also developed apps for ebooks and the audiobooks they sell. And they developed an launcher which focuses on ebooks and audiobooks over other types of content. As you can see in the screenshot below, this launcher offers separate pages for ebooks, audiobooks, and apps. It's designed to search your Android tablet and find all of the Epub and PDF ebooks on the device, and then organize them into a simple catalog. Select one, and you will be prompted to open the ebook with FBReader (audiobooks require the LitRes Listen! app). But in spite of the issues I encountered, I am sharing it because I hope that you will have better luck. And if you don't well, it only wasted a few minutes of your time. You can find this launcher in Google Play along with the FBReader app, the LitRes Listen! (required for audiobooks), and other apps. I'm still looking for an alternate home screen which fills my needs. If you know where I can find one, or if you have a better way to accomplish this goal, don't hesitate to leave a comment. Thanks! I use an android tablet as an ebook reader. Nexus 7, kept on using it since it came out. Because I read about 2-4 books per week, I also take management seriously. First up, I use Calibre on my PC. It does EVERYTHING, grabs metadata from the internet, formats and converts books in any format, you can sort, tag and organize thousands of books (some mention libraries of 30.000 books or more). The second feature, it has, can serve those books through a server, with an interface accessible by any web-browser, or as an OPDS catalog which most worthwhile readers know how to use. As a side note, it can manage copied books to devices when they’re connected to the PC by moving or tagging. Second, are the readers. You can look at the free ones, best I found was FBreader, very stable and simple to use. For paid apps, my favorite was Moon Reader, a little more complicated to use, but it can be fully customized and has a lot of useful extras. If you have audiobooks, then use an mp3 player. Since it’s a tablet, you’ll certainly have lots of music as mp3. A tablet is not a dedicated ebook reader, it has it’s pros and cons, something, the user should have considered before buying. One problem with saying that you cannot turn a tablet into an ereader is that Kobo has shown that you can do just that, and that the idea works for some users. Nice article, Nate. Thank you. Thanks for this excellent well research article. With the low cost of all these devices, perhaps it is best to use a dedicated good ebook reader and have a tablet for other uses. I find when I read, I want it simply to work and I do not want all the distractions of a table. However, I think that in the near future these problems will disappear and the ebook readers will merge totally into a color tablet with all manufacturers. You have indicated that trend with the Kobe Arc 7. What about readers who don’t read just ebooks, but also want to mix in news and other types of reading? What about those of us who like LCD screens, or don’t mind our reading being interrupted by emails? There’s a niche use case here that isn’t really being supported yet, and I find it interesting. I always liked the default launcher on the Sony PRST1, even after rooting and adding other apps to it. Works very well for a reading-centric device. Perhaps the modded launcher could work in tablets? Or, there was a small handful of alternative launchers for the Nook and Sony readers that also focused on reading. They might work also. I only found one, though I did find several dead links. The one I tried was made for the Nook. It didn’t scale well to a 7″ screen, and it was really designed to be more of a tablet interface than a ereader interface. How I can work on word file in android sw.
What type of file is it, specifically? There are office apps for Android, but they have only limited support for file types.